With two games left in a seven-game road trip, the Nashville Predators were a bit weary. Even though they had won their previous game 2-1 over defending Stanley Cup Champions the Los Angeles Kings, there was a bit of an edge being up against the San Jose Sharks, the last undefeated team in the NHL. Nashville Head Coach Barry Trotz made many line adjustments going into the game. Deciding to dress seven defensemen and an extra forward, leading him to the opportunity to see what worked best to get the Predators up and going three weeks into the season. After a very uneventful first and second period, the score was still tied at 0. Each team battled for possession, until Preds’ forward Colin Wilson found teammate Sergei Kostitsyn coming up the slot 59 seconds into the third. He sent a quick pass, Kostitsyn wrangled the puck and shot it up and into the corner of the goal, beating Sharks’ goalie, Antti Niemi. The goal was Kostitsyn’s first of the season. With only eight minutes remaining in regulation, the Sharks converted on a power play opportunity after the Predators were called for too-many-men. Sharks’ Martin Havlat scored his third goal of the season with a pass from Scott Gomez from behind the net of Preds’ goalie, Pekka Rinne. The Sharks’ Havlat was called for hooking with 2:12 remaining, giving the Predators a chance to end the game, but the Sharks killed it off, raising their penalty kill to 21 straight. With the game tied at 1, the Predators and Sharks went into five-minute overtime. Once again, neither team was successful in ending a game in five minutes of overtime, sending them to a shootout. The shootout was the fifth in eight games for the Predators and third in as many games for the Sharks. The shootout went for eight rounds, coming down to Predators’ Craig Smith. He went in close on Niemi, deking around him and backhanding it into the net. The Sharks place Joe Pavelski up to shoot, but Rinne stopped him, giving the Preds a 2-1 victory and ending the Sharks’ perfect season. Ending their road trip against fellow Central Division team, the St. Louis Blues, the rivalry was on. In their last two meetings this season, the Predators were shut down by the Blues with 4-3 overtime and a 0-3 regulation losses. Predator fans were hoping for a bit of revenge. Entering the game was an NHL-low record of only 12 goals in their first 8 games, the Predators surprised fans (and everyone) by putting up 3 goals in the first period alone. Defenseman Ryan Ellis scored first for Nashville, sliding the puck past Blues’ goalie Brian Elliott on a hard angle. Rich Clune then tallied his first of the season, followed closely by teammate Nick Spaling. Preds’ forward Colin Wilson stated, “Our offense, sometimes it can be mental. Guys got a few points and we started feeling good about ourselves. That’s going to help in the long run.” Wilson would end up being more right than he could have ever expected. After the second period, the Predators were now up 5-0. Elliott gave up his fourth goal after only facing 11 shots, being beat by Preds’ defensemen Kevin Klein. He was promptly replaced by rookie goaltender Jake Allen. Allen gave up a goal late in the second to Gabriel Bourque. Martin Erat scored the Preds sixth and final goal in the third period, killing any hopes for the Blues to rally back. The game ended with a 6-1 victory for Nashville, ending a scoring drought that had plagued them since the shortened season began. The Predators ended their road trip with a 4-2-1 record, tying with the franchise history. With a quick trip back to Bridgestone Arena to play the LA Kings, the Nashville Predators were glad to be back on familiar ice. The Predators were riding high on a four-game winning streak, while LA had lost three of their last four. Head Coach Barry Trotz had some worries going into January 21st game against LA, mainly concerning the two-week long road trip the Preds were returning from. “When you go on long road trips, every coach will tell you there is a fear the first game back,” Trotz stated. There seemed to be no loss of stride for Nashville. At 2:54 of the first period, Preds’ David Legwand sent a backhand pass to teammate Gabriel Bourque who was coming into the high slot. Bourque beat LA’s goalie, Jonathan Quick, with a one-timer to his glove side. Colin Wilson added another goal for Nashville at 7:01 of the second period. The goal had an assist from defensemen Kevin Klein who sent the pass to Wilson in the low slot. Wilson had an easy tip-in past Quick. The goal was Wilson’s second of the season. Klein also had two assists in the game, leading all of Nashville’s defensemen with four assists. Wilson added his second goal of the game, third of the season, and third for Nashville, raising the score to 3-0 at 13:02 of the second period. Wilson poked the puck into the net in front of Quick who was trying to rally the puck after a slapshot from Predators’ captain, Shea Weber, who finally notched a point this season. Nashville goaltender, Pekka Rinne, stopped 32 shots to record his first shutout of the season. LA outshot Nashville 32-14. Nashville started backup goalie Chris Mason in net against the Minnesota Wild, but even his sensational play couldn’t stop a bad call by the officials that ended up costing the Predators a fifth win to add to their streak. Paul Gaustad put the Predators on the board first. Craig Smith came in hard on Minnesota goaltender, Niklas Backstrom, then beat defensemen Ryan Suter to send a pass to Gaustad. Cal Clutterbuck answered Nashville’s goal, tying the game at 1. That score remained until five minutes of overtime were needed. 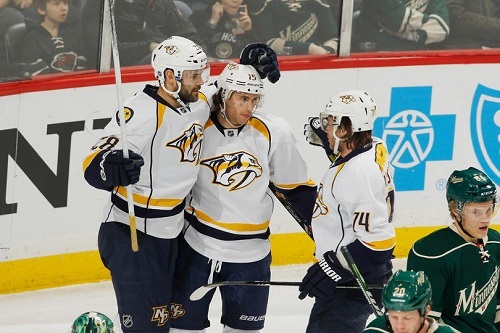 Late in overtime, Gaustad took a penalty for a hand-pass on a faceoff in Nashville’s zone. Gaustad, along with everyone on the Predators bench, including coach Trotz could not make sense of it. “I’m going to get an explanation from the league,” Trotz said, “For me, it was a poor call, a questionable call at a very important time of the game. I mean, come on. I don’t agree with that at all.” Trotz has been on the committee that examines the faceoff rule. During their powerplay opportunity, Mikko Koivu sent a pass to Devin Setoguchi who blew a shot past Mason. Mason has stopped thirty shots in his two starts, both against Minnesota, this season.